Dec. 5 - Board meeting. Members and guests are always welcome. Jan. 2 - Board meeting. Members and guests always welcome. Jan. 11 - Holiday party. Join us as your social calendar eases up after the hectic holidays. A special evening is in store at the historic Fox & Hounds Restaurant near Holy Hill. Details here. RSVP by Dec. 20. Jan. 25 - Watch the start of 24 Hours of Daytona. We will meet for the start of the event at a location TBD. Grab a beverage and cheer for your favorite Porsche team. May 16 - 18 - Spring driving tour weekend in Northern Wisconsin. An invite from the Fox Valley Region. Details here. It's the time of the year when four seats are vacated on the region's board of directors and four directors are elected to serve a two-year term. Details here including how you can cast your vote. Bill Eungard shared his Porsche ownership story. “I traded in my first Porsche (2001 Boxster) and purchased a 2010 Boxster in July. I had been searching the Internet for a while to find a black one with sand beige interior and a manual transmission. This one just happened to come up locally and it was a one owner car. Bill is a mechanical engineer in charge of R&D. The Milwaukee Region welcomed the following people to PCA and the region in October. Thanks to all members who renew their memberships on time. Remember, you can add a family or affiliate member (friend or other relative) to your membership at no additional cost. Log into your membership data at www.pca.org to review your membership data or update it. Check out the latest classifieds here. Members can use our classifieds at no cost to advertise their items for sale or wanted. Norlan and Karen Kemp toured the Porsche Museum and other sites in Germany, Austria and France recently. Check out their story and photos here. Porsche introduced the newest Panamera recently and some region members had a chance to check it out at a party hosted by International Porsche for its customers. Check out the photos and story here. Coffee Travelers with or without whale tails on their Porsches drove to Wales, Wis., in search of good coffee and even better conversation. Check out the report from this event. 20 Porsches were featured in a special display during Cedarburg's Octoberfest. Check out the story and photos here. Drive for Babies...a special event at Road America to raise money for the March of Dimes. Check out Donna Daufenbach's photostory here. When Ron Pace, president – Decorative Products for Kohler Co., agreed to once again be a judge at the August 2013 Milwaukee Masterpiece Concours d’Elegance car show, he expected to see some very rare cars. What he discovered hit closer to home than he could have imagined. The Milwaukee Masterpiece show features roughly 200 cars from across Europe and the U.S. Gary Sonnenschein of New Hampshire drove halfway across the country to enter his micro car, the France Jet, a 1959 two-passenger, fiberglass Jet body. “When this car turned up at the Milwaukee Masterpiece, I was very intrigued,” said Pace. “But my biggest delight was discovering it featured the original rear-mounted, two-cylinder KOHLER® engine.” The France Jet includes a KOHLER K662 twin engine, still fully functioning. Kohler records show an engine spec created for the Lofstrand Co. in 1960. The 1959 KOHLER engine-powered France Jet is the one and only car of its kind manufactured in the U.S.
2015 Porsche Macan....read what Motor Trend has to say about this much-anticipated model. Learn more at the Porsche website. Seven generations of the 911 "singing" a birthday tribute. "Listen" here. Check out this story and video about the 911 2.7-liter engine. Driving is a passion....check out this video of the passion often found at Road America. A 914 hatchback? Region member Mike Wiviott found this story. Check it out here. After breaking ground on the Porsche Experience Center in August, Porsche Cars North America (PCNA) is making progress on the 53-acre facility located in Carson, Calif. The Center will overlook the Porsche Test Track, which offers drivers a variety of track configurations and surface conditions on which Porsche road cars can be studied, along with the human performance of the drivers themselves. To celebrate the construction progress, Porsche unveiled a new look for the iconic Muffler Man fiberglass statue, located off the 405 freeway. He now proudly wears a Porsche racing suit and serves as gatekeeper for the Experience Center site. The new complex will feature the Porsche Human Performance Center and sports science lab, offering customized programs to maximize personal fitness and wellness for race car drivers and endurance athletes. The world-class facility will also include a business and conference center; family-friendly café; upscale restaurant; and, trackside viewing, dining and conference spaces that will be available for car clubs and corporate clients to reserve for events. The complex will be home to Porsche Motorsport North America (PMNA), who is moving their current operations from Santa Ana, Calif. PMNA sells production-based race car models to customer teams in North America and provides them with parts, service and expertise in between races and at the track. For the first time ever, Porsche will also be able to provide factory-backed classic car restoration and maintenance services at the new facility. The Porsche Experience Center has already been a boon to the local economy, as the luxury automaker has invested $28.7 million and created 310 jobs during the project development phase. Once operational, the facility is expected to result in the creation of 135 additional jobs and generate $22.5 million in economic activity each year for Southern California. Porsche broke ground on the Carson facility in August 2013 and anticipates that construction will be completed and facility operations will commence during the fourth quarter of 2014. A second North American Experience Center is also under construction in Atlanta, part of the company's new U.S. headquarters. 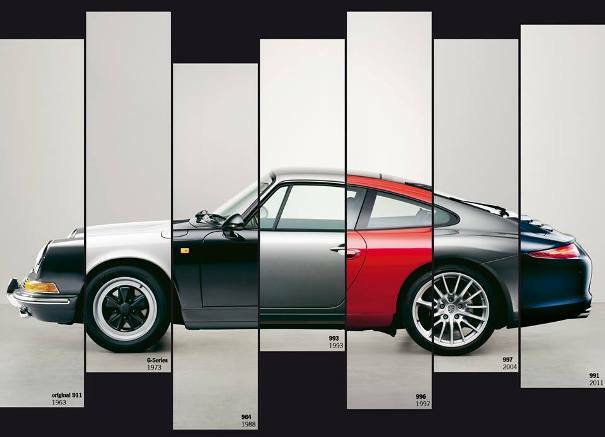 The 911 through the ages...what model is your fave?